There is nothing like a tender juicy grilled pork belly for lunch on a weekend or any day that you feel like having one. 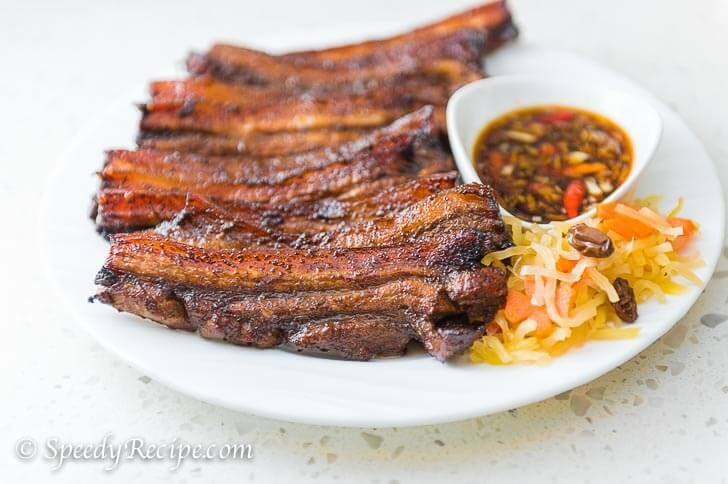 Fortunately, I was able to source a tried and tested pork belly marinade recipe which is Filipino inspired. This pork belly recipe that we have here is inspired with that marinade and it really made a difference. When you get the chance to check the recipe below (or the link to the source above), there is an ingredient that might be unfamiliar. Have you heard of banana ketchup? This is also known as banana sauce. It is a popular ketchup variety in the Philippines. It tastes sweeter than regular tomato ketchup and it is one of the secret ingredients to make a delicious tasting pork belly. Too bad, the secret is now out in the open. This pork belly dish is best eaten with rice and pickled papaya. The rice can be regular cooked white rice, while the pickled papaya is on the sweeter side. This is known as “atcharang papaya”. It is composed of shredded green papaya, slices of carrots, raisins, and garlic slices. There are lots of ways to grill pork belly. You can also use different equipment. By far, a charcoal grill is on the top of my list. Gas grills, oven, and a grill pan will also work. I think that the smoky flavor contributes a lot to the success of this dish. That is just my opinion, you can try it yourself using different types of grills and let us know. Try this Grilled Pork Belly Recipe. Enjoy! This is a recipe for grilled pork belly. It is known as Inihaw na Liempo in Filipino. Combine all the marinade ingredients in a mixing bowl. Stir until all the ingredients are well blended. Put the sliced pork belly into the bowl with the marinade. Make sure that the pork gets coated. Cover the bowl. Refrigerate for 6 hours. This will be enough time to marinate the pork. Prepare the basting sauce by combining all the ingredients in a bowl. Mix well. Heat-up your grill. Grill one side for the pork for 3 to 4 minutes. Baste the top part by brushing the basting sauce. Turn the pork belly over. Let it cook for 3 minutes. Brush some basting sauce on the top part. Continue turning over the pork belly every 3 to 4 minutes while basting, until it is completely cooked. (Turning it over constantly prevents the pork from getting burnt). Serve with pickled papaya and rice.